Recipientless baby quilt and Fresh Sewing Day linkup. This is a quilt that I started for a friend’s baby. I decided that another top will fit a little better, so now I have to find a recipient for this one! I have enough blocks to do a column on the back, to stretch the backing fabric out a bit. It’ll either be pink or blue gingham or the green hello pilgrim stripe. Any thoughts? 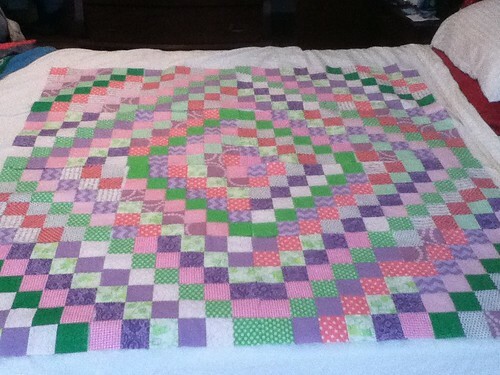 And I’ll be posting on Friday about this quilt, finished! The quilts look great. I’m hoping to do a trip around the world with batiks, but the blocks will be smaller. I think any one of your options will look great! 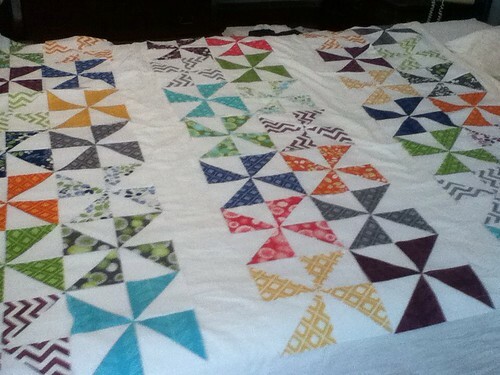 All 3 of your projects are so striking… I really like the layout of the pinwheels with the sashing strips. I like all three of your quilts but the pinwheel takes the cake. It’s lovely to say the least. 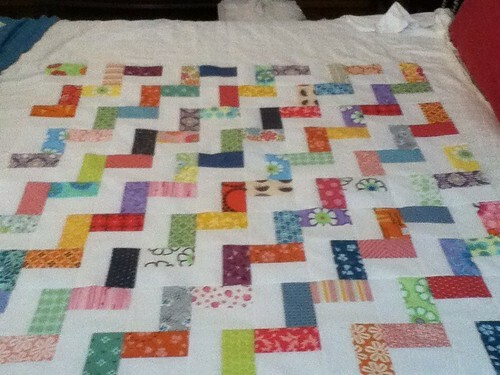 I love all three quilts but the scrappy trip one is my favourite – I like the idea of the green stripe for backing! I like the pinwheels the most. Pretty layout.